Keep an eye on your pet in real-time from your smartphone, tablet, or computer! Ever wonder what your pets are doing while you’re away? Now you’ll know! Pet Vision Live is a digital audio video camera which enables unlimited monitoring of your pets and their environment via your smartphone, tablet or compatible PC. You can simply watch their activity remotely, take actual snapshots, or record live video. This system is great for identifying behaviors that might causes a nuisance to your neighbors. Maybe you’re curious which pet keeps getting into the trash or chewing your favorite shoe? Ever wonder how your dog manages to escape from his crate? Maybe you’re just curious about how your pets are spending their time while you’re away. This tool let’s you see exactly what your pet is doing…real-time! It can also provide invaluable information to share with your vet, trainer, or pet behaviorist. Within its base, the camera has full 355° horizontal rotation and 90° vertical movement. You can set the camera to do a constant “sweep” of the area or you can set it to a fixed location. You can even remotely move the camera with your phone/tablet/computer to pick up a different view or “follow” your pet. There is a movement detection system that can activate based on motion. The 2-way audio function enables you to hear your pet and talk to them, making PetVision Live a truly interactive system. 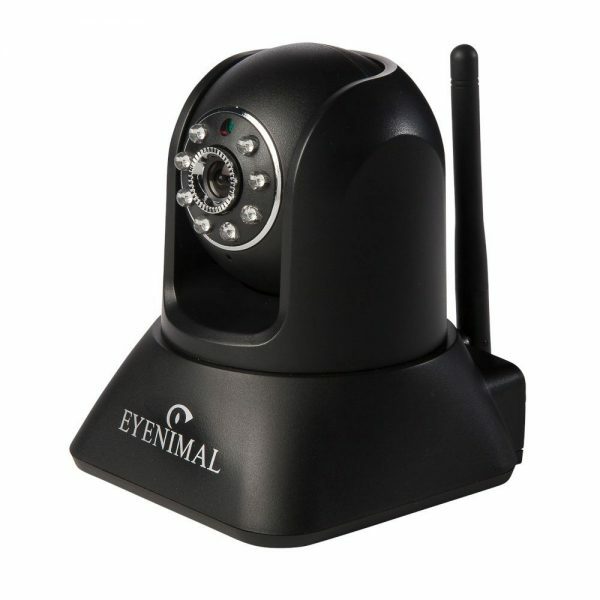 The camera automatically switches to night mode when needed and incorporates infrared night vision (up to 32.8 feet away). The free dedicated application for your Smartphone (Apple & Android) is quick and easy to use. Plug and Play connection to your internet network and Wifi.